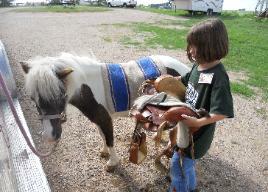 Your child will learn about horses, ride, groom, saddle and feed ponies, enjoy craft time and cowboy roping games. 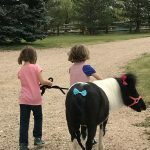 They eat snack and lunch, then visit the petting zoo barn to feed and pet mini donkeys, mini pigs, bunnies, and dwarf goats. Mostly, they just have fun! 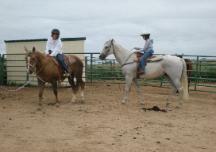 Ever wanted to learn about horses or take riding lessons? 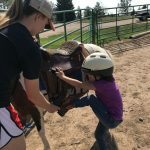 We provide a fun and independent atmosphere for you or your child to learn or improve riding skills. 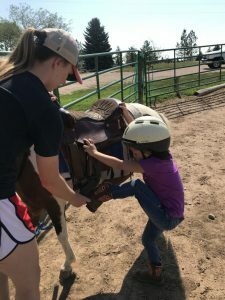 Instructor rides with students to show proper techniques and riding style. 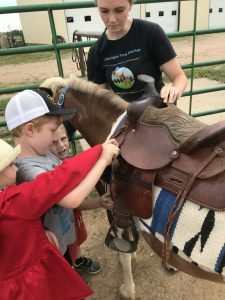 We have over 20 years of experience in teaching and practicing western horsemanship, raising horses and rodeo competition. 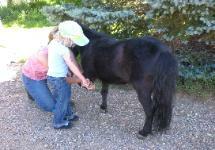 Plus: a lesson at our farm is like a trip to the petting zoo every time!! Call 970-566-2193 and make your reservation today!